The card allows you to use up to 5.5MB of RAM without affecting the PCMCIA port but above this the PCMCIA port is unusable. 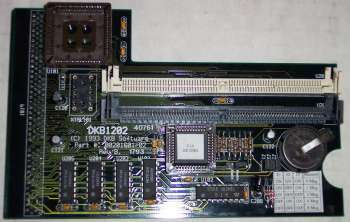 The card was also supplied with a program called MagicMem. The "MagicMem" program operates automatically, and does not require any input from the user. 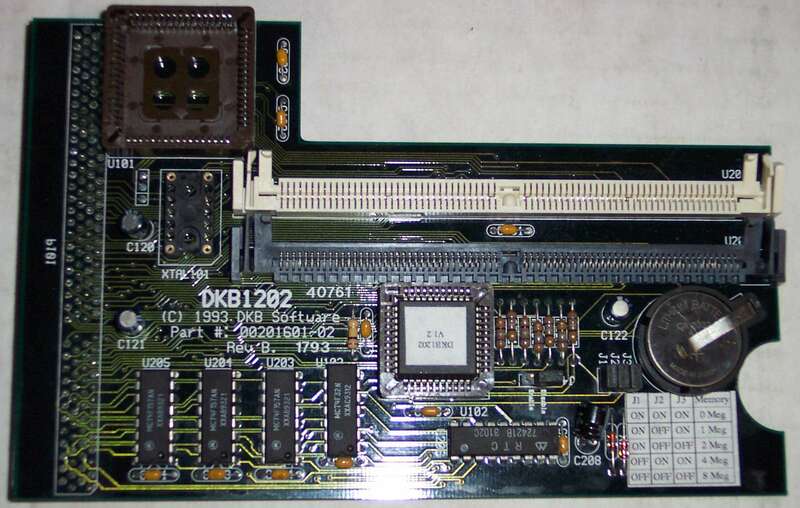 If there is a 1-meg SIMM installed in te DKB 1202 card (and the jumper settings correctly reflect this configuration), the program will add this memory to the computer. If there are two 4-meg SIMMs installed (and the jumpers are set for 4 megabytes), the program will check the existence of a PCMCIA card. If none are present, the entire 4megabytes of memory will be added in its normal address space. If such a card is present, however, 1.5 megabytes out of the second 4 megabytes will be added at the $C00000 address space for a total of 5.5 megabytes, the maximum amount of expansion RAM that can be added when a PCMCIA card is in use. For advanced users, there are two ToolType options which may be set by selecting the "MagicMem" program icon, and selecting the "Information" menu item from the "Icons" menu of the Workbench screen. The NO4MEG ToolType will always add the second bank of memory at the $C00000 address space, so that you can never have more than 5.5 megabytes of expansion RAM. The NOC00000 ToolType will never add the second bank of memory at the $C00000 address. If you use both ToolTypes, the second bank of memory will never be added. Page contributors: Alastair Boyanich, Amiga Deals, Gavin Fance.